So I have been doing a ton of reading and watching videos and ended up going with the Lee four hole Turret press. The kit comes with some things that I think I will end up upgrading in the future but should get me started. I decided to stay away from the progressive press until I have a little more time and knowledge under my belt. The big reason I went with the turret is, it looks like I can still get quite a few rounds done in a reasonable amount of time and do the loads that I need. I will bought the dies for 30-06 .223 and 40S&W. I will need 9mm but have to wait till I have a little more cash. The next thing I will be shopping for is the case prep stuff. So I will always take recommendations. Thanks for all the feed back. There are a lot of things you CAN do for case prep and if you are shooting competition you would want to do those. But for informal target shooting you can keep it pretty simple. I recommend keeping case prep as simple as possible and then adding steps as you see the need for more accuracy. Handgun straight wall cases like 9mm can be pretty much sized and loaded, and optionally cleaned if you want. 1. Clean - mainly because you will be lubing the cases and they undergo much more sliding pressure than pistol cases. Simplest is to use vibratory cleaner and walnut or corncob media. I tried sonic cleaners but the batches are small and the vibratory wore out in less than a year. I now use wet stainless media to get super shiny brass but that is totally aesthetics, not functional. 2. Lube - Must lube before sizing. The volume you process may influence the method used. The .223 brass has relatively little friction in the sizing die except at the very base (head). It does not require much lube. Since I reload large numbers of .223 brass at a time I prefer to use Hornady One Shot spray dry lube. It is not a great lube but sufficient for .223 and super quick to apply. 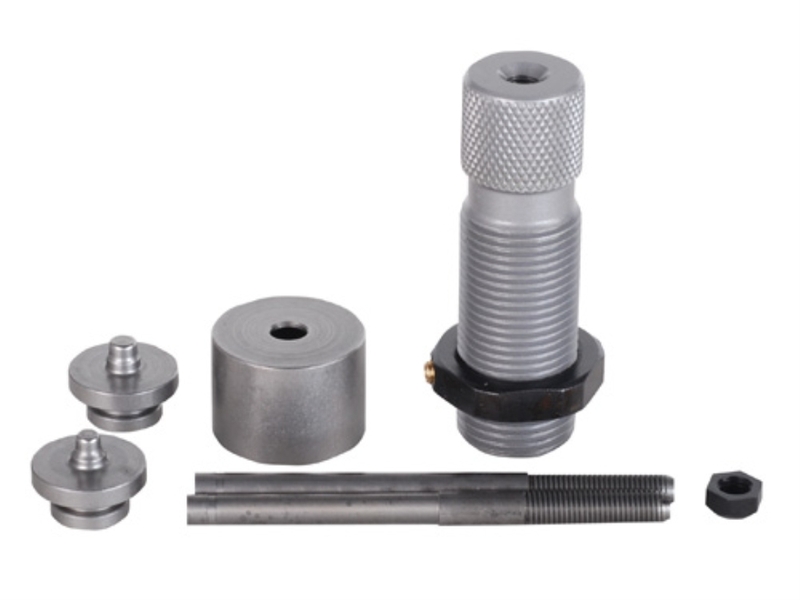 The .30-06 cases have much more friction in the die along most of the length of the case. So I use Imperial Case Wax for these. Just lightly wipe your finger across the wax then rub around the case head and up the sides. A touch of wax goes a long way. 3. Size - normal sizing, and decapping (unless you decapped before cleaning). There are a ton of various dies but a standard neck sizer for a bolt action, or a full length sizer for semiauto and multiple rifles is fine to start with. Don't get too caught up yet with case neck concentricity, neck wall thickness, etc. Some rifles need to have the case sized in a "small base" die, while others get by with a standard full length die. I load for several Garands and AR15s and never had a need for a small base die. The SB die will work the brass more and weaken it so avoid it unless needed. 4. Trim - AFTER the case is sized, then you want to measure the case length and trim if over max case length spec in reloading manual. Usually trim by .01" - .02" under max. Some guys just trim every batch and don't bother waiting for it to get over max. If you crimp (not necessary, usually) then you want all the cases to be pretty close to the same length or the crimp will be off on some. Again there are numerous methods for trimming. Lee has a pretty nice press mounted trimmer (Deluxe Quick Trim) that is affordable. If you do a lot of cases in a couple of calibers then something like the Little Crow Worlds Finest Trimmer is super for mounting in a drill and accurately trimming hundreds or thousands of cases. If you want more precision then something like the Wilson bench trimmer is really nice. I have all of these and others (it is a hobby right? ) and use them for different purposes. I use the WFT for .223 and .30-06, the Wilson for when most other rifle cartridges, and just getting familiar with the Lee but it looks like it could replace the Wilson by being faster and cheaper. 5 Chamfer/Debur - If you trim the brass then it will leave sharp 90* edge at the case mouth. Since rifle cases are not belled during reloading, but instead the bullet is inserted against a tight case neck, it helps if the case mouth is chamfered. A simple hand tool can do one or both operations (chamfer the inside edge and bebur the outside edge). You may want to run the cases back through clean corn cob media again to remove the case lube, but again functionally it is optional. 6. Inspect - During all aspects of handling cases I am looking for any signs of case neck cracks or case body splits, or the bright ring near the head indicative of imminent case head separation. Most small dents will be pushed out during the next firing, but if the dent is large enough to make a crease in the brass then toss it. When seating the primers pay attention to cases that allow the primer to go in effortlessly. Those cases have had too much pressure and it enlarged the primer cup. Toss them. Any time a case behaves oddly in the reloading process set it aside until you can examine it in detail. If you have any doubts about it throw it out (well recycle anyway). I probably lose about 1%-2% of cases at the range and about another 5% during reloading. The higher pressure you load the cases at, the faster they will stretch out and need to be tossed. I load below max pressures and typically get at least 10 reloads per case. I find defects at all steps. Sometimes it is only when seating a bullet that a very small case neck crack shows up (bullet seats with no friction). Other steps which may be necessary but not always are decrimping the primer pocket on military brass (either by cutting to size or swaging to size the primer cup opening/shoulder); and cutting the primer pocket to a uniform depth (uniforming) if primers feel much different case to case when seating the primers. * Method to clean cases such as tumbler and media and screen; or just wash the major dirt of with dish soap and dry in the sun, or oven at 150F. * Full Length or Neck size dies. * Possibly primer pocket tools such as swager or uniformer. Personally I like the RCBS tool that you can put in a drill an it cuts a 45* angle into the pocket opening to remove the crimp. It is relatively cheap and fast and you only have two version, one for each diameter of pocket (S or L). For a huge quantity of brass I use the Dillon Super Swager which is bench mounted and is very fast, but it requires a post that fits snugly to the case mouth so it is caliber specific and takes about 5 minutes to switch between posts. And it cost about $100. Start simple and get more sophisticated as you learn and see the need for what and how you shoot. If you're a heavy .223/5.56 reloading, you'll eventually end up with crimped primer pockets. All things considered, I'd prefer to squeeze material rather than cut it away. After accumulating several hundred NATO cases that had tight primer pockets, spending less than $30 seemed sensible. Only complaint is on my single stage Lee Classic, it slightly bumps part of the press frame on the lowest position of the stroke. I prefer a reamer to swaging on primer pockets. I can ream ten cases in the time it takes to swage 3-4....and I never ding a case mouth by reaming. But context is you only need to "open" the crimped primer pocket once. So unless you routinely shoot new 5.56/NATO rounds, this won't be a routine process. I own the Lee precision classic turret press and a RCBS single stage press. I really like the Lee Classic press. I would stick with the classic model as I have heard bad things about some of the other models. I think the Lee dies are easier to set up and I can quickly change calibers by changing the turret. The press has some cheap plastic parts on it but you can easily stockpile the inexpensive parts to make sure it will work in the future. It is great for cranking out pistol ammo. I use my RCBS press for rifle ammo as I like to weigh each powder charge. I know the Dillon and other more expensive presses are better but they are twice as expensive. I can crank out about 200 rounds an hour with my Lee Classic press and it cost just over $200. It is a pleasure to use. The manuals are easier to read than the RCBS ones. Consumable parts are reasonably priced for this press. I would give the Lee press a recommendation unless your a serious competitor who needs more than a thousand rounds a month. If that is the case then get a Dillon. I have preferred the uniformity of the swag system VS the rotary cutter though it may make little difference.